Specially curved mascara shield ensures precise mascara application, if lashes are thin or thick. Excess mascara goes onto the mascara guide, not on the delicate skin around your eyes. Plastic is 5" x 1 3/8". I was never able to apply mascara to my bottom eye lashes as they are very sparse. This product enables me to define my bottom lashes. This item has been rated pretty poorly but I decided to give it a try any way. Once you get the hang of it, it works great! I use it to set up bare lashes first by separating them and plumping them up before applying mascara. 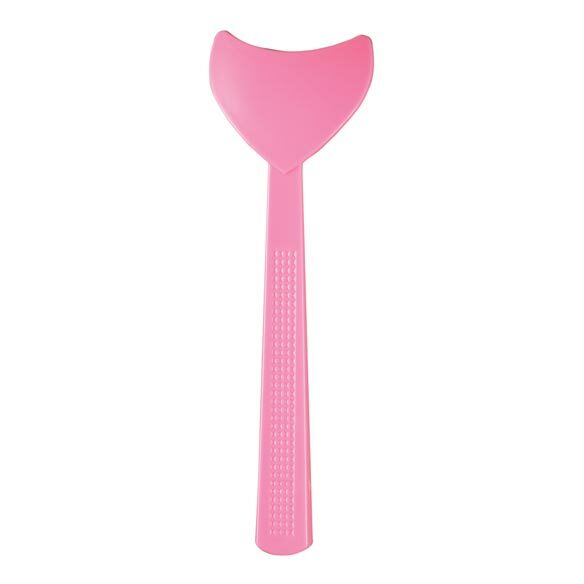 I love that it is washable and fits my eye contour really well. I have always had 2 problems when using mascara: the mascara clumps, and some of it usually ends up on my upper lid, and especially my lower lid. The shield prevents smearing of the mascara on the upper and lower lids - yay! It also means that I can now apply two or three coats of mascara for more definition if I want. The teeth of the steel comb are so much finer than the plactic separator that I have used without much luck in the past, and it makes all the difference in the world. The comb separates upper and lower lashes very well, and prevents those awful clumps while making my lashes look longer. Easy to clean with eye makeup remover or soap and water. This item saves time from makeup mishaps and helps define lashes by eliminating clumps. Absolutely love....wish they came out with them many years ago. Makes applying mascara and liner a whole lot easier. Thank you. I like it but I just don't take the time to use it. It does what it's supposed to do for the most part. Really helps when applying mascara especially under the eye! Is a little thick though and you must use care when placing under the eyelashes. I guess it has a learning curve. Great idea but I'm going to have to "dremel" the width of the curve...it's too thick. Good idea; but . . . . Cost was decent, but in using this product I felf it was too thick of plastic, and it got in the way of my mascara brush. I liked the idea of it not being so messy around the under lashes with mascara on my skin, but this needs some improvement of more thinner, and more flexible. Didn't try the brush so can't comment. I was very optimistic about the shield because I have a problem with putting mascara on my bottom lashes without getting some on the lid. This turned out to be a waste of money. The mascara just got on the shield and not on my lashes. Big thumbs down! The item is too bulky and you need three hands to use it. One to hold the shield, one for the mascara and one for a mirror. I would not recommend this item at all. The lash shield was too thick to go under the bottom lashes, and I never received the lash comb. I thought this would be a great makeup tool. It is too thick, so it is hard to get underneath the eyelashes good enough to block the skin from mascara. I'll have to stick with kleenex. I was excited to receive this but it still smudges mascara on your skin and doesn't fit the eye properly. I bought the shield to prevent the mascara from smudging under my eyes. The shield stops that, but it also causes you to get the mascara on the inner rim of the lower eye lid. I am not happy with it! Maybe it's me, but I found this gadget useless. Doesn't fit right under lashes. Can't get mascara applied with shield in place. The item is too thick and not flexible enough, messy for applying mascara. I bought other items from you and are happy, but not this one. I was very excited about this product when I saw it but after getting it dd not find it effective at all. This makes more of a mess than to just put your mascara on and use a QTip and clean up the small errors you made. This item is too thick to lay properly under the bottom eyelashes. I got more mascara on the wand than on my eyelashes. This product did not do the trick for me. When I used it under my bottom lashes, it was tricky to hold in place and I still had mascara smudges under my eyes. I thought the price of [$] was a little much but I was willing to pay it if it solved my make-up problems. I wish I had that money back. It probably wouldn't have disappointed me so bad if I had paid under $5 for it, but considering it's just a flimsy piece of plastic that didn't work, I was very disappointed. I had a hard time holding the shield in one hand under my eyelashes while trying to put the mascara on with the other. It wasn't worth the money. This item is a waste of money! This product is really a complete waste for what it is supposed to accomplish. It is too expensive for what it is, or does. I threw it away! I want to see if this product helps with the problem of mascara smearing on my skin . Eye sight is not as good as it was and those lower lashes are thinner than when I was younger. I chose this item because I have very few lashes on my lower eyes and I hope it will keep me from getting mascara on my skin. good thing this thing did not cost a lot I would have been mad! this thing was a ripoff!!!! 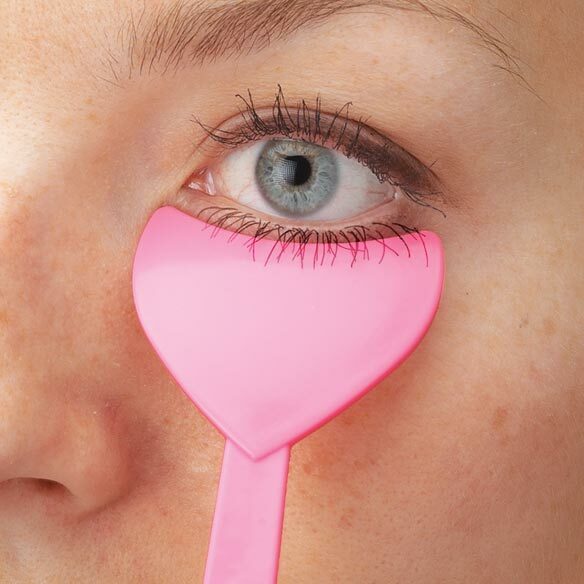 To keep mascara from getting under eye while applying it to lower lashes. I had to break down and get one of these because the older I get the worse my eye sight gets, then ultimately the worse my eyeliner and mascara look when I put my glasses back on.